Microsoft is warning Windows Vista users that a forthcoming service pack for the operating system may stop some third-party programs working. 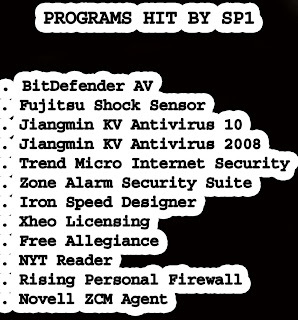 The software giant has released a list of programs that may be broken by the SP1 update for Vista. Most of the software hit by the upgrade are security programs that prevent Windows users falling prey to viruses, Trojans and booby-trapped web pages. The Windows Vista update will be released to the public in mid-March. Service Packs are among the biggest updates Microsoft issues for its various operating systems. The software firm said SP1 makes Vista more secure and reliable and introduces some new features. The list of programs affected by SP1 is divided into three.Some will be blocked by the update, some will not run and others will lose some of their functions. Of the 12 programs mentioned six block viruses or keep an eye on the places someone visits online. Microsoft warned that its list was not "comprehensive" and asked people to get in touch with the maker of any affected software to fix problems. Although the update will become widely available in March, Microsoft is releasing it to business customers in February. Microsoft has also been forced to withdraw an update to Vista that was required before Service Pack 1 could be applied. Writing on the Windows Vista blog, Nick White, Microsoft product manager, said the company had withdrawn the preparatory update while it investigated. Isolated reports suggest that some machines on which the preliminary update has been applied go into an update loop. He wrote: "We are working to identify possible solutions and will make the update available again shortly after we address the issue."